If you have photos you would like to share with the immersion community, please send them to the webmaster. 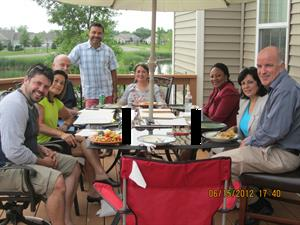 Photos of our professional development events can be seen here. Emerson, June 2012: Jim Clark from Windom Spanish Immersion makes a point while Cindy Moeller and Jennifer Vanyo Olson, Yinghua Academy, listen. Emerson, June 2012: Gina Singleton, Mpls Public Schools, speaks while Karen Balmer, MN Board of Teaching, and Richie Kucinski, Spring Lake Park Spanish Immersion listen. In May 2012, Claudia Baldwin, MAIN chair, Fatima Lawson, Board member and Kim Miller, Webmaster met with Sen. Patricia Torres (2nd from right) to discuss the implications of Basic Skills testing. 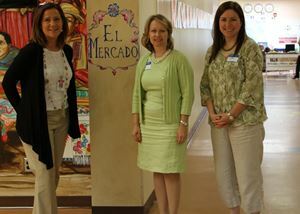 Representative Jenifer Loon (center) visited Eden Prairie's Eagle Heights Spanish Immersion school in May 2012 with principal, Elizabeth Linares (left), and parent, Kathy Moore (right).